Taxi from malaga airport to Nerja? Special rates for 24,25,31th December and 1th of January with a fee, contact US! Transfer in a NEW Mercedes E-Class per 65€! We have a class Mercedes taxi and volkswagen caravelle to do transfers from Malaga airport to Nerja and many other destinations. Book your Nerja Taxis. 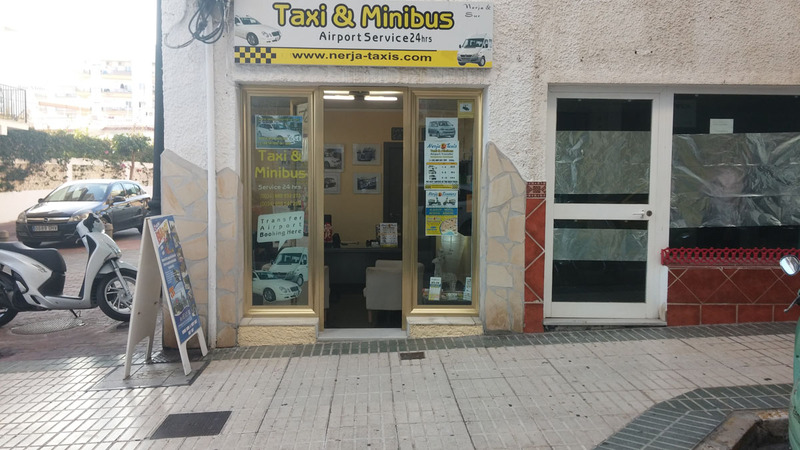 all warranties that can only offer an official taxi service in Nerja, no queues or waiting, conducted by authorized local transport authority with a previously agreed rate, no surprises ... cars do you need more reasons to book your transfer Taxi in Nerja? Reservations Nerja Taxi 365 days a year, 24 hours a day. 24h telephone assistance for any problem with your shipment. No management costs for the reservation or surcharges for credit card payment. Modification and Booking Cancellation free taxi. Reserve with just 2 hours before your taxi will be waiting. Change your taxi booking until 1 hour before the scheduled time. We are a friendly, reliable, multilingual company that you can trust. We have our own drivers and a fleet of top quality cars and buses. The best prices for taxis, mini bus and transfers from Malaga Airport! 24 hours service to and from any location - every day of the year! All our vehicles are air-conditioned models for ultimate comfort. Child booster and baby seats available. Reserve taxi transfers Nerja / Airport, visits to the city of Nerja, transfers from hotels, tourist routes in towns like Ronda, train and bus stations and any destination in Nerja, Malaga, Spain. Book in advance and safety your taxi transfer. Malaga is a beaty place, and a young, vibrant cultural hub, filled with artists, trendsetters and creatives from all media. It is a multicultural wonderland of creativity, with young people flocking from all over the globe to visit, to live and to explore this awe-inspiring city. Malaga Airport is the only current airport serving in Malaga and is located just 3km from Malaga centre. The airport has 3 terminals for various international arrivals and departures. Malaga Airport is very close to the capital city and handles nearly seven million passengers each year. Ensure you can enjoy your holidays in Malaga with ease and book with us now to reserve your airport transfer and save a small fortune. You can book a private taxi in Nerja or minibus, or utilise our shuttle bus service, so you can arrive at your chosen destination without worrying about how you’re going to get there. We can take you to a wide range of popular resorts. Make sure you get your holidays off to a relaxing start and book your Malaga Airport transfer with us today. After the baggage to your flight arrival Your driver will help you with your luggage to your vehicle waiting just outside the Arrivals Hall. You will not need to queue! You will arrive in Nerja or other destination. Please note: In very busy periods, your taxi or minibus driver may not have arrived yet due to unforeseen circumstances. Please wait for him and he will arrive very shortly. The price list below shows total all-inclusive prices for transfers from Malaga airport to Nerja and eastern costa del sol locations for a single journey. Prices are per vehicle and not per person. Special rates for 24,25,31th December and 1th of January with a extra fee. Courteous, efficient and hardly dearer than a taxi. The return journey was especially good, the taxi driver was very friendly and even pointed out a few historic sites just outside of Nerja. A great start to our stay in Nerja! Like what you see? Are you ready? You know what to do. Nerja Taxis. All rights reserved.